Published on April 26, 2011 in Branding. 1 Comment Tags: Brand, Branding, Logo, Marc Dussault, Product Names. In the previous post on this subject, we discussed the concept of branding. I have a question for you – where did HMV, the record company’s name come from? If you guessed His Master’s Voice, you’re right. If you are old enough to remember the cute image of the terrier looking INTO a gramophone/phonograph. That was a PRICELESS image that an Exponential Marketer would KEEP USING over and over again – BECAUSE it works – it captures the essence of the message in ONE VISUAL. Sound so well reproduced a dog can’t distinsguish it from his master’s. Just because you might get tired of it – your prospects won’t. There was an Exponential Marketer in the US who would take successful campaigns that were abandoned by companies when they wanted to switch to the next ‘big thing’ and he’s just ask for permission to use their concept – 9 out of 10 agreed – to their utter detriment. They had made ALL the investment and he got ALL the rewards for his clients. BRILLIANT strategy – TOTALLY exponential. When you see someone take a concept from Bland to Brand and they abandon it – JUMP ON TO IT!!! Don’t steal it – that’s wrong, but jump onto the concept! Published on June 24, 2009 in Marketing Mistakes To Avoid. 0 Comments Tags: How To Deal With Marketing Mistakes, Marc Dussault, Marketing Mistake, Marks & Spencer, Marks And Spencer, Mistakes, Retail, Retail Mistake. Peter The Baker Is At It Again! 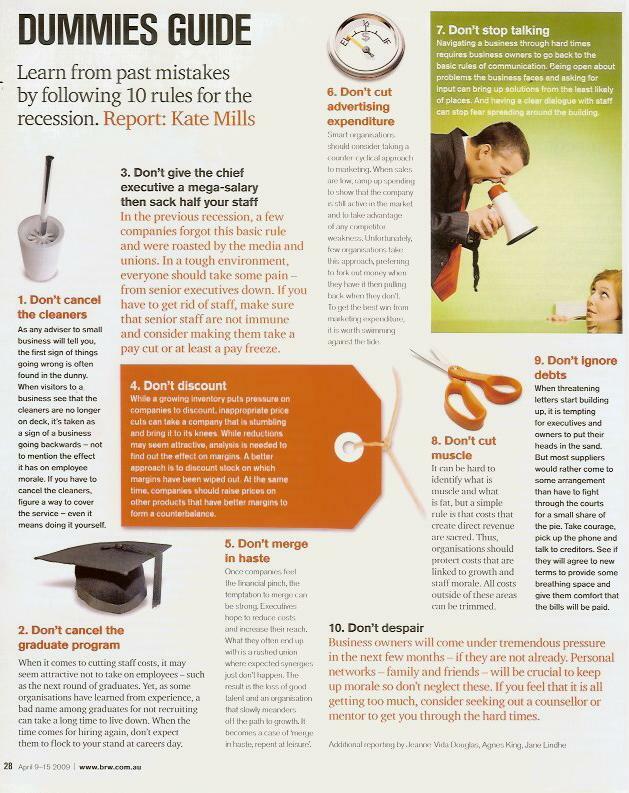 Published on April 28, 2009 in Case Study, Marketing Mistakes To Avoid and Retail Strategies. 1 Comment Tags: Baker, Bakery, Exponential Marketing, FREE Samples, Marc Dussault, Marketing, Retail, Samples, Wholesale. If they don’t agree I don’ bother giving away $25.00! Sometimes it’s the SIMPLEST IDEAS that create the greatest value… There is beauty in the elegance of simplicity! Published on April 26, 2009 in 1% Improvement and Exponential Mindset. 1 Comment Tags: Marc Dussault, Priorities, Productivity, time management, Voluntary Simplicity. I know this sounds obvious, but it needs to be said. I can’t tell you how many times people get themselves into trouble because they don’t read their e-mails. These are the same people who are subscribed to everything and anything they come across. That is INSANE! I mean it, Stop it! I have elite clients called Platinum Members and I recently spent 4 hours explaining to them the principle of Voluntary Simplicity – simply put, it’s SIMPLIFYING your life so you live it ON PURPOSE so it’s fulfilling, energising and rewarding. The workshop was called how to do 3 times as much in 1/2 the time. That means GET OFF all those distracting e-mail lists and subscriptions that don’t add value. We’ve discussed it before – if YOU don’t value your time, no one else will. Every MINUTE you WASTE or LOSE because of distraction takes you AWAY from your PRIMARY PURPOSE. I know it sounds pedantic and IT IS – it’s also critically important. If you are subscribed to 10, 20 or 30 e-mail, newsletter and other subscriptions that are NOT CONVERGENT on YOUR PRIMARY PURPOSE, you are diffusing your effort, focus and attention. A master archer focuses on ONE BULLS EYE TARGET at a time. You need to be doing the same. Go on, unsubscribe from all the e-mail lists, newsletters, blogs and subscriptions that do NOT contribute to the attainment of your goals and purpose. If they all contribute something, then cull from the least valuable at the bottom of the list to get MORE TIME BACK. TIME TO READ THE E-MAILS THAT ARE IMPORTANT. If you have more than 10 to 20 e-mails in your e-mail inbox – you have too many = You’re overloaded. How can you possibly have ‘CONCENTRATION OF FOCUS’ if you’re pushed and prodded in 10 different directions? Published on April 24, 2009 in Exponential Mindset and General. 0 Comments Tags: Anthony Robbins, Anthony Robbins Foundation, Charity, Date With Destiny, Generosity, Giving, Marc Dussault, Philanthropy, Tony Robbins, Tony Robbins Foundation. If you haven’t been to Anthony Robbins‘ Date With Destiny – you’ve missed out on a magical opportunity to well, create your ultimate destiny. The program’s phenomenal format and content cannot be summarised in a blog post, but what I do what to share with you is one of those ‘magical moments’ when Tony revealed that $518,000 was raised in ONE WEEK. ONE WEEK, in the middle of a recession… An all-time Australian record. The winning ‘team’ from Japan raised $165,000! Once again – in ONE WEEK, in the middle of a recession. It happens BECAUSE people want to be more than they are-> they want to contribute to others. What does that have to do with Business Mastery? Give more, be more and encourage your clients more and see what happens. Let me be clear – Tony did not mention donations even one single time from stage – NOT ONCE. He totally gave of himself 1,000% and THAT made people WANT to give, contribute and donate to the foundation. Go on and give it a go. Published on April 21, 2009 in 1% Improvement, Do Stuff and Exponential Mindset. 0 Comments Tags: 4-hour work week, Efficiency, Marc Dussault, Productivity, Work Less. If you forgot, I recently blogged about how you can double your sales… by working 120 hours/week. Once you’ve given that an honest go, you’ll want to give the reverse an equal effort – work LESS than 30 hours/week. That’s right – Work ONLY 30 hours/week. For most entrepreneurs that less than 50% of the time they spend working. First, you’ll have to pick WHAT to work on that is your HIGHEST AND BEST USE. Second, you’ll have to PLAN AHEAD a lot more otherwise your business is going to go bust. Third, you’ll have to delegate a HELLUVA lot more! Fourth, you’ll have to find something to do for those 30+ hours/week you’re not working! Try it for a week and see what happens. You’ll be shocked by the lessons learned! Published on April 18, 2009 in Marketing Mistakes To Avoid. 0 Comments Tags: business, Kill Sales, Lose Sales, Marc Dussault, Marketing Mistakes, Mistakes, Recession. She ain’t right MATE. She’s p_ _ _ _ed! When you deal with mates, you deal with being pushed to the end of the queue, at the bottom of the to do list. This is even worse during a recession when times are tough and money’s tight. The ‘high paying’, no make that the PAYING clients will get ALL the attention and ALL the results. Otherwise you’re going to KILL your business twice as fast. There, I’ve said it. I can relax and get back to work. Don’t get me wrong, I do lots of work with mates, but I don’t expect mates rates and I pay on time to GET ON TIME SERVICE. A Federal Tax Break Of 30%? Published on April 10, 2009 in General and Reduce Costs. 1 Comment Tags: Accounting, Deductions, Federal Tax Break, Fiscal Planning, Marc Dussault, Tax Bonus, Tax Break. The Federal Government is offering an extra 30% bonus deduction for business purchases of “eligible assets”. This means that if you buy an “eligible asset” between December 2008 and 30 June 2009 and it is fitted/installed before 30 June 2010, you will get a bonus tax deduction of 30% of the eligible asset’s value ON TOP OF your usual tax depreciation. Note, it DOESN’T apply to capital works covered by Division 43 of the ITAA Act 1997 are EXCLUDED from the bonus scheme. Just something that might be of value… You never know – a penny saved is a penny earned!